The origin of organic matter found in meteorites that formed during the birth of the Solar System 4.5 billion years ago may provide key clues to understanding the birth of life here on Earth. According to a study led by the University of Manchester, it could also help astronomers investigate the potential habitability of other solar systems. Manchester/UK — The new research, published in ‘Proceedings of the National Academy of Sciences of the United States of America (Pnas)’, confirms that organic materials accreted in chondritic asteroids probably formed via basic chemical reactions during the infant stage of our Solar System. Carbonaceous chondrites are meteorites that originated from chondritic asteroids that are as old as our Solar System. Researchers, led by Dr Romain Tartèse of Manchester’s School of Earth and Environmental Sciences, have been analysing the isotopic makeup of oxygen in the organic materials found in these specific meteorites. Isotopes are atoms of the same element that share the same numbers of protons, but have a different numbers of neutrons. Isotopic analysis provides scientists with the isotopic signature of a compound, which acts as a fingerprint of processes involved in its formation. By doing this, the team has helped pinpoint the origins of the organic materials contained within the meteorites, which are made up of key elements necessary for life, such as carbon, hydrogen, oxygen, nitrogen, and sulphur. The findings suggest that if organic materials can form by basic chemical processes operating in our Solar System, there is a possibility that they are widespread in other planetary systems. Carbonaceous chondrites are made of the first solid materials — such as rocks, organics, water ice, and fine grain dust — formed in the Solar System. When found on Earth and analysed in detail, they act as time capsules for understanding how planets formed and evolved over billions of years. Organic-rich carbonaceous chondrites are particularly rare, comprising only a few per cent of all known meteorites. Earth is a dynamic planet — processes such as plate tectonics and erosion have erased most of the early Earth records. This makes comprehensive studies on chondrites all the more important to understand how our planet formed and evolved. 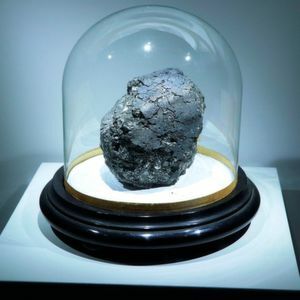 Using samples from the Muséum National d’Histoire Naturelle in Paris, the research team spent two years precisely measuring and interpreting the oxygen isotope composition of organics in some of these early-formed meteorites. The study provides the first “high-precision triple oxygen isotope analysis” of carbonaceous chondrite organics. Past studies mostly focused on two other building blocks of life abundant in organics – hydrogen and nitrogen. Oxygen has a crucial advantage over other elements, such as hydrogen and nitrogen, as it is fairly abundant in these meteorites, comprising 10-20 % of chondrite organics. But most importantly, it is made of three different stable isotopes, while hydrogen and nitrogen only have two stable isotope varieties. 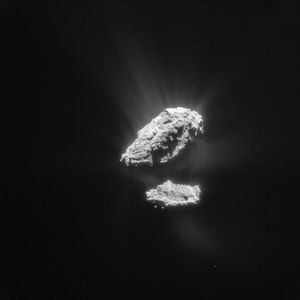 Where Does the Oxygen on Comet 67P Come From? Having three stable isotopes, oxygen offers an extra level of information compared to elements with two stable isotopes such as hydrogen and nitrogen, providing critical clues to further constrain the origin of chondritic organics. Dr Tartèse added that the oxygen isotope pattern had been similar to the relationship linking the composition of the Sun, asteroids and terrestrial planets. Therefore, this likely implied that carbonaceous chondrite organics were formed through chemical reactions in the early Solar System, rather than having been inherited from the interstellar medium.